After opting out of the NBA Draft, Lavoy Allen returns to Temple with a new vision for his final season on North Broad Street. When the 2010-11 season is said and done, senior forward Lavoy Allen of the men’s basketball team may go down as one of the most prolific Owls of all time. In his three years on Main Campus, Allen has started 99 games, scored 1,069 points and grabbed 854 rebounds, the seventh-highest total in program history. Allen needs just 189 rebounds to pass John Baum for the most ever. He’s been named to the All-Defensive Atlantic Ten squad twice and was recently named to the watch list for the Wooden Award, an award given to the nation’s best collegiate player. During the summer, however, Allen almost gave it all up when he declared for the NBA draft. After entering his name into the early entry pool, Allen was brought in for a workout with the Portland Trailblazers, one of two NBA teams with workouts geared toward non-seniors. Ultimately, after having two flights canceled on his way from Philadelphia to Portland and back, Allen decided to remove his name from the draft before the deadline. 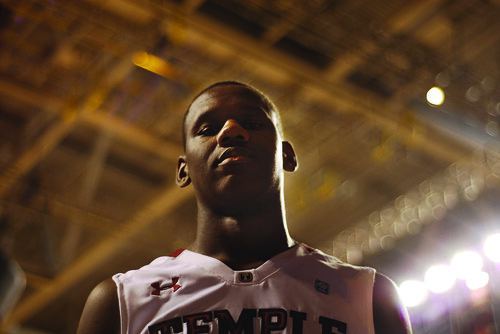 Since Allen never hired an agent, he was still eligible to return to Temple for his senior year. ANNA ZHILKOVA TTN Lavoy Allen practiced with the Portland Trailblazers this past summer but decided to come back to play for the Owls this season. Allen’s decision to return to North Broad Street paid extra dividends when he was chosen as one of 20 collegiate players named to the USA Men’s Select Team. The team practiced against the USA Men’s National Team that won the 2010 International Basketball Federation Championships. For this experience, Allen traveled to Las Vegas, where his squad would train against NBA stars Rudy Gay, Kevin Durant and Lamar Odom. After a summer of life-defining experiences, Allen recommitted himself to Temple basketball this fall. A First Team All-A-10 selection last year, Allen demonstrates talents that have also helped improve his teammates’ play. During team practices, Allen often goes up against junior center Micheal Eric, a process that has had an effect on both players, Eric said. Since lead scorer Ryan Brooks graduated, Allen, who has never scored more than 23 points in a game, will likely need to increase his offensive numbers for the team to be successful. The 6-foot, 9-inch forward’s work over the summer will make that easier, coach Fran Dunphy said. Dunphy said the team needs Allen to play more aggressively on offense in general and for his average to reach the midteens on a regular basis. Allen said his main goal is to score more. “I want to score inside, outside and through a variety of ways,” Allen said. Despite his emphasis on offense, Allen said he also wants to remain true to what’s gotten him where he is. By this time next year, Allen may very well have realized his dream of playing in the NBA. Until then, he’ll focus on his current goal – leading Temple to its fourth-straight A-10 title.